A young woman, raised from childhood to be a killer, is co-opted as an assassin by the Korean secret service. I found this film quite astonishing - in its physical brutality (from the first frame, in an extended first-person solo assault on a building full of henchmen, to the last, following a wrenching axe fight aboard a bus), but also in its intense emotional overwroughtness. What came to mind for me was Jacobean tragedy as much as anything else. There are all sorts of details that I suspect viewers might have difficulty with - one character's maternity and a another's creepiness among them - but to me they are ingredients in a soup of bloody emotional turmoil. 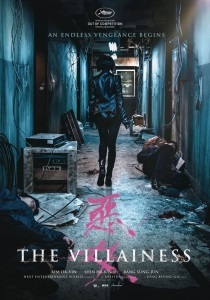 The film is certainly knowing enough that it's shot through with references to its most obvious comparators - Nikita and Kill Bill Vol 1 come most readily to mind - yet confident enough to ultimately be its own beast. See it now, before the inevitable disappointing Hollywood remake in five years' time. I loved it - it seems to be dividing people (every review is either "Holy hell this movie set my balls on fire!" or "humph, fatally tonally erractic") and I'm firmly pro. What a spectacle, with a great leading actress holding down the main role. Like Atomic Blonde plus Days of Our Lives.